Tyler Lee Clippard (born February 14, 1985) is an American professional baseball pitcher in the Cleveland Indians organization. He has played in Major League Baseball (MLB) for the New York Yankees, Washington Nationals, Oakland Athletics, New York Mets, Arizona Diamondbacks, Chicago White Sox, Houston Astros and Toronto Blue Jays. After playing baseball at J. W. Mitchell High School in New Port Richey, Florida, the Yankees drafted Clippard in the ninth round of the 2003 MLB draft. He debuted with the Yankees as a starting pitcher in 2007. The Yankees traded him to the Nationals before the 2008 season, and the Nationals converted him into a relief pitcher in 2009. Clippard led the major leagues in holds in 2014. He was named to the MLB All-Star Game in 2011 and 2014, and won the MLB Delivery Man of the Month Award in June 2012. The Nationals traded Clippard to the Athletics before the 2015 season, who traded him to the Mets during the 2015 season. He signed as a free agent with the Diamondbacks before the 2016 season, and was traded to the Yankees in 2016. He began the 2017 season with the Yankees, but was traded to the White Sox, and then to the Astros. He signed with the Blue Jays in 2018. In 2019 he signed with the Indians to a minor-league contract. Clippard began his high school career at Palm Harbor University High School in Palm Harbor, Florida. After failing to make the varsity baseball team in his first two seasons, he transferred to J. W. Mitchell High School in New Port Richey, Florida, where he played for the school's baseball team. As a junior, in 2002, he won six games. He was named to the All-Conference first team. In 2003, his senior season, Clippard had a 1–1 record with an 0.81 ERA and 31 strikeouts in ​17 1⁄3 innings pitched. However, he was dismissed from the school's baseball team after being charged with driving under the influence of alcohol. Clippard transferred to Dunedin High School in Dunedin, Florida, which had a nationally ranked baseball team. Clippard attempted to play for their team, but the move was blocked by the Florida High School Athletic Association, as players are not allowed to transfer during the course of a season, nor are they allowed to transfer to avoid sanctions given for disciplinary reasons. After taking classes at Dunedin for a month, Clippard transferred back to Mitchell in order to graduate from high school with his friends. Clippard competed for the Central Florida Renegades in Connie Mack Baseball, an amateur 18-and-under competition organized by the American Amateur Baseball Congress. He earned pitcher of the week honors in the Florida State Elite Baseball League in June 2003. Clippard also played golf at Mitchell. As a sophomore, in 2001, Clippard was named one of the ten best golfers in Pasco County. He registered the best individual score in the Sunshine Athletic Conference tournament that year. He was named to the All-Conference first team as a junior and to the All-County as a senior, and helped lead Mitchell to victory in the Sunshine Athletic Conference tournament during his senior year. Without the benefit of a full senior season to show himself off to scouts, Clippard proactively sent scouts a schedule of when he was throwing and attended as many showcases as he could. He trained with Roy Silver, a retired professional baseball player, who worked with Clippard on his mechanics and his maturity. Clippard's father, Bob, teamed up with Tom Kotchman, father of Florida high school player Casey Kotchman, to form showcases with past teammates of Clippard. Clippard was drafted in the ninth round of the 2003 Major League Baseball (MLB) draft, with the 274th overall selection, by the New York Yankees. Though he had signed a National Letter of Intent in the fall of 2002 to attend the University of South Florida on a baseball scholarship, allowing him to play college baseball for the South Florida Bulls, he chose to turn professional due to his draft position and the opportunity to play for the Yankees. Clippard made his professional debut that year in the Rookie-level Gulf Coast League (GCL) with the GCL Yankees, pitching to a 3–3 win–loss record with a 2.89 ERA. In ​43 2⁄3 innings, he allowed 33 hits and five walks while striking out 56. Moving up to the Battle Creek Yankees of the Class A Midwest League for the 2004 season, Clippard had a 10–10 record with a 3.44 ERA and a strikeout-to-walk ratio of 4.53:1 in 25 starts. Clippard was 10–9 with a 3.18 ERA for the Tampa Yankees of the Class A-Advanced Florida State League (FSL) in 2005. He was named to the West team in the FSL All-Star Game. However, he did not appear in the game, as the Charleston RiverDogs of the Class A South Atlantic League needed another pitcher that day. Clippard was named FSL pitcher of the week for the week of July 10 through 17. For the season, opponents batted .219 against him and he struck out 169 batters in ​147 1⁄3 innings, while walking 34. He led Yankees farmhands in strikeouts and finished fifth in the affiliated minor leagues, behind Francisco Liriano, Joel Zumaya, Rich Hill and Chuck James. He also led the FSL in strikeouts and was seventh in ERA. However, he did not make the FSL post-season All-Star team and Baseball America did not rank him as one of the league's top prospects. Baseball America ranked Clippard as the Yankees' tenth best prospect heading into the 2006 season. Promoted to the Trenton Thunder of the Class AA Eastern League in 2006, Clippard again led Yankee farmhands in strikeouts (175). He allowed just a .200 batting average and had three times as many strikeouts as walks. Clippard was 12–10 with a 3.35 ERA for the Trenton Thunder. He threw the first no-hitter in franchise history on August 17, shutting down the Harrisburg Senators. He was named the Eastern League's pitcher of the week for his accomplishment. Earlier in the season, Clippard flirted with a perfect game, retiring the first 21 batters in a game against the Binghamton Mets. Clippard also won nine straight games at one point, breaking the club record of eight shared by Tomo Ohka and Carl Pavano. He teamed with Phil Hughes to form one of the best pitching duos in minor league baseball. Clippard again was fifth in the affiliated minors in strikeouts, trailing Yovani Gallardo, Francisco Cruceta, Matt Maloney and Franklin Morales. He led the Eastern League in strikeouts and was seventh in ERA. Baseball America ranked him as the tenth-best prospect in the Eastern League. Clippard began 2007 with the Scranton/Wilkes-Barre Yankees of the Class AAA International League. He was 3–2 with a 2.72 ERA in his first eight starts, striking out 41 in 39 2/3 innings but allowing 40 hits and 17 walks. Though the Yankees experienced injuries in the starting rotation, they called on Matt DeSalvo and Chase Wright before Clippard. When Darrell Rasner broke his finger in May, Clippard was called up to New York. He became the seventh rookie to start a game for the 2007 New York Yankees, following Hughes, DeSalvo, Rasner, Wright, Kei Igawa and Jeff Karstens. Making his MLB debut on May 20, 2007, in an interleague game against the New York Mets, Clippard recorded his first MLB win. He pitched six innings, giving up one run off the bat of David Wright and three hits. He struck out his first major league batter, José Reyes, on three pitches. He recorded his first career hit in his second at-bat off Mets pitcher Scott Schoeneweis, a double to right center in the sixth inning. Clippard was optioned back to the minor leagues in June. He struggled in his return to the minor leagues for Scranton/Wilkes-Barre, and was demoted to Trenton in July. Though he was a member of the Trenton team as they won the Eastern League championship, Clippard struggled in the playoffs. The Yankees recalled him in September. Overall with, he had a 3–1 record and a 6.33 ERA with the Yankees. 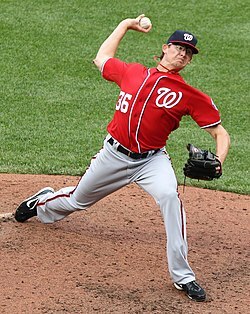 Clippard was traded on December 4, 2007, to the Washington Nationals for relief pitcher Jonathan Albaladejo. The Nationals viewed him as a contender for a spot in the starting rotation. However, he began the season with the Columbus Clippers, Washington's Class AAA affiliate. He pitched his first game for the Nationals on June 9, 2008, after Odalis Pérez was placed on the 15-day disabled list. He was optioned to the minor leagues after this start, but was given a second start a few days later, as Pérez was not yet ready to return. The Nationals then optioned Clippard to Columbus after his second start, in which Clippard pitched to a 1–1 record and 4.35 ERA. He was recalled later in June as Shawn Hill was placed on the disabled list. He spent most of the season with Columbus, going 6–13 with a 4.66 ERA. He tied Yorman Bazardo and Charlie Haeger for the most losses in the International League that season. During spring training in 2009, the Nationals optioned Clippard to the Syracuse Chiefs, Washington's new Class AAA affiliate. Despite starting six games with the Yankees in 2007 and two for the Nationals in 2008, he was converted to a relief pitcher for the 2009 campaign. Nationals' pitching coach Steve McCatty told Clippard that his future was pitching in relief, because his pitch count tended to get too high in starts, and opposing batters hit Clippard well by the third time the lineup turned over in a game. Clippard at first resisted the transition to the bullpen, but conversations with his father and agent, Casey Close, reassured him to continue pursuing his dream. Clippard appeared in 20 games for Syracuse in 2009, posting a 4–1 record, 0.92 ERA, and 42 strikeouts in 39 innings. Clippard pitched in 14 consecutive scoreless appearances before being promoted to the Nationals on June 21, 2009, replacing Kip Wells in the Nationals' bullpen. Used sparingly in the first weeks after his promotion, he posted a 2.69 ERA through ​60 1⁄3 innings, with 67 strikeouts. Since 2010, Clippard has pitched exclusively out of the bullpen; primarily in the eighth inning. That season, Clippard and Drew Storen served as setup pitchers to Matt Capps. After pitching effectively in the first half of the season, Clippard and Capps earned the nickname "Clip and Save". 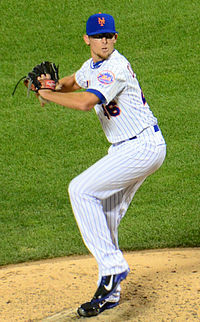 Clippard finished eighth in the National League in appearances, with 78. He won eleven games on the season, which led the team. In the first half of the 2011 season, Clippard had a 1–0 record and 1.73 ERA. He struck out 63 batters and allowed only 26 hits in ​51 1⁄3 innings pitched, and allowed only six of 32 inherited runners to score. For his achievements, Clippard was selected to appear in the All-Star Game. He earned the victory for the National League as the game's winning pitcher, despite not retiring a batter. Adrián Beltré, the only batter Clippard faced, singled, but Hunter Pence threw out José Bautista at home plate, and the NL took the lead in the next inning. Clippard finished the season with a 3–0 record, a 1.83 ERA, and 104 strikeouts in ​88 1⁄3 innings pitched across 72 appearances. He led the National League in win probability added. Before the 2012 season, Clippard and the Nationals agreed to a one-year contract worth $1.65 million, avoiding salary arbitration. Clippard became the de facto closer for the Nationals in the first half of the 2012 season. After injuries to Storen and Brad Lidge, Henry Rodríguez became the closer, but Rodriguez lost the job to Clippard due to his struggles. The Nationals kept Clippard as their closer even after Storen returned to the team. He was named the Major League Baseball Delivery Man of the Month for his performance in June 2012, recording ten saves in ten opportunities, and allowing zero runs in ​11 2⁄3 innings pitched. Clippard earned $4 million in 2013. He had a 6–3 record with a 2.41 ERA and 73 strikeouts in 71 innings pitched. Clippard and the Nationals agreed on a $5.875 million salary for the 2014 season. He appeared in 20 of the Nationals' first 40 games, and struggled with poor command of his pitches. His command improved as his workload decreased, and he was named to the appear in the 2014 All-Star Game. He ended the season with a 2.18 ERA, and led MLB with 40 holds. The Nationals traded Clippard to the Oakland Athletics for Yunel Escobar on January 14, 2015. Clippard and the Athletics agreed on an $8.3 million salary for the 2015 season. With Athletics' closer Sean Doolittle beginning the season on the disabled list, Clippard served as the team's closer. Clippard saved 17 games for the Athletics, pitching to a 2.79 ERA in ​38 2⁄3 innings. On July 27, 2015, the Athletics traded Clippard to the New York Mets for pitching prospect Casey Meisner. Clippard returned to a setup role, with Jeurys Familia remaining the Mets' closer. In ​32 1⁄3 innings with the Mets, Clippard pitched to a 3.06 ERA. In the 2015 MLB postseason, Clippard allowed five earned runs in ​6 2⁄3 innings. After receiving fewer contract offers than he had expected, Clippard signed a two-year, $12.25 million contract with the Arizona Diamondbacks on February 8, 2016. Through July 31, 2016, Clippard pitched to a 4.30 ERA in ​37 1⁄3 innings with one save. On July 31, 2016, the Diamondbacks traded Clippard to the Yankees for Vicente Campos. He had a 2.49 ERA in ​25 1⁄3 innings pitched for the Yankees in the remainder of the 2016 season. He began the 2017 season with a 1.57 ERA in 23 innings. He then struggled with his command, pitching to a 13.06 ERA over his next ​10 1⁄3 innings, though he followed the All-Star break with two scoreless appearances. As a result, his ERA rose to 4.95. On July 18, 2017, the Yankees traded Clippard, Blake Rutherford, Ian Clarkin, and Tito Polo to the Chicago White Sox for David Robertson, Todd Frazier, and Tommy Kahnle. Clippard made 11 appearances with the White Sox, earning two saves, and pitching to a 1.80 ERA. The White Sox traded Clippard to the Houston Astros in exchange for a player to be named later or cash considerations on August 13, 2017. Clippard broke the news himself by changing his biographical information on Twitter and Instagram. With the Astros to finish 2017, Clippard made 16 more appearances out of the bullpen, having a 0–2 record and a 6.43 ERA. Overall in 2017, combined with all three teams he had played for, Clippard's total stats came to 67 appearances out of the bullpen, a 2–8 record, and a 4.77 ERA. The Astros finished the 2017 season with a 101–61 record, clinching the AL West. Clippard, however, was not part of any postseason action, although he was still on the Astros 40-man roster at the time. The Astros won their first World Series in franchise history as they bested the Los Angeles Dodgers in 7 games of the 2017 World Series. Clippard would still win his first career World Series championship after 11 seasons of service in the Majors. On March 7, 2018, Clippard signed a minor league contract with the Toronto Blue Jays. His contract was purchased by the Blue Jays on March 29, 2018, and he was assigned to the Opening Day roster. After Roberto Osuna, the Blue Jays' closer, was placed on administrative leave in May, Clippard began receiving save opportunities. Clippard received his World Series ring on June 25, when the Blue Jays visited Houston. On August 2, Clippard made his first start since 2008 against the Seattle Mariners. His 680 relief appearances between starts established a new major league record. Clippard finished the 2018 season with a 3.67 ERA, 7 saves, 15 holds, and 85 strikeouts over 68​2⁄3 innings. On February 23, 2019, Clippard signed a minor league contract with the Cleveland Indians, receiving a non-roster invitation to spring training. The contract is worth $1.75 million if he pitches at the major league level. Clippard was released by the Indians on March 20 and re-signed on the same day. Clippard is listed at 6 feet 4 inches (1.93 m) and 170 pounds (77 kg). He has an unorthodox pitching delivery, rocking forward while sticking his gloved hand high in the air, which creates an unusual arm angle while pitching, making it difficult for hitters to pick up the ball in their line of vision. Clippard's father taught him to pitch this way when Clippard was eight years old by having him throw his baseball glove. McCatty nicknamed Clippard's delivery "The Funk". Clippard primarily throws a fastball and a changeup. His hard, straight four-seam fastball averages about 92–93 miles per hour (148–150 km/h), topping out at 96 miles per hour (154 km/h), and sets up a deceptive changeup in the high 70s to low 80s. Periodically, he throws a cutter early in the count to right-handed hitters and a curveball in the mid 70s. Nardi Contreras, who worked with Clippard as the Yankees' minor league pitching coordinator, indicated that Clippard's greatest success comes from his curveball and changeup. Clippard has compiled a strikeout rate of greater than 10 per 9 innings over his career. According to Clippard, "I don't try to strike out everyone that I face. Strikeouts just kind of happen with the way I pitch." Clippard was raised by his parents, Bob and Debbie Clippard. He has a brother named Colin, who played Little League baseball with Tyler. He is from Tampa, Florida. ^ Schwarb, John (August 23, 2001). "Chemistry leads team to triumph: The Palm Harbor baseball team of 15- and 16-year-olds tossed aside their egos and frustrations, and won a world championship title". St. Petersburg Times. Retrieved July 5, 2012. ^ a b c d e f Romano, John (July 11, 2011). "Former Tampa Bay area player Tyler Clippard writes storybook ending with major-league All-Star selection, win". Tampa Bay Times. Retrieved July 5, 2012. ^ Page, Rodney (October 9, 2001). "Sports: Palm Harbor U. builds powerhouse". St. Petersburg Times. Retrieved July 4, 2012. ^ a b c Gyr, Alex (August 2, 2006). "Clippard making up for lost time: Yankees prospect started pro career close to home in Tampa". MLB.com. Milb.com. Retrieved July 4, 2012. ^ Auman, Greg (March 28, 2003). "Pasco: Ex-Mustang transfers but will be ineligible". St. Petersburg Times. Retrieved July 4, 2012. ^ Putnam, Bob (June 3, 2005). "Sports: Ex-Mustang named to FSL all-star team". St. Petersburg Times. Retrieved July 4, 2012. ^ Williams, Joe (June 14, 2003). "Lakers' 10-under Team Enters Tourney". Orlando Sentinel. Retrieved July 4, 2012. ^ a b Gould, Izzy (May 22, 2007). "Ex-Pasco star makes pitch for glory". St. Petersburg Times. p. 1. Retrieved July 10, 2012. ^ Thalji, Jamal (October 17, 2001). "Sports: 'Dogs defend another title". St. Petersburg Times. Retrieved July 5, 2012. ^ Thalji, Jamal (November 23, 2001). "Pasco: High school sports honors". St. Petersburg Times. Retrieved July 5, 2012. ^ "Sports: Mitchell wins wild tournament". St. Petersburg Times. October 23, 2002. Retrieved July 4, 2012. ^ a b c d e f g 2 Photos (July 11, 2011). "Nats' Clippard set up to succeed". Washington Times. Retrieved July 5, 2012. ^ a b Simonetti, Thomas (August 9, 2005). "Clippard gets back on pace". St. Petersburg Times. p. 4. Retrieved July 4, 2012. ^ "Sports: FSL: Yankees finally hit stride". St. Petersburg Times. July 22, 2005. Retrieved July 5, 2012. ^ Ratliff, Jason (August 30, 2005). "FSL All-Stars: Tigers, Dodgers galore; First-half champs claim nine of 18 spots on postseason roster". MLB.com. Milb.com. Retrieved July 8, 2012. ^ "2005 Top 20 Prospects: Florida State League". Baseball America. September 28, 2005. Retrieved July 8, 2012. ^ a b "Clippard named Eastern League Pitcher of the Week – OurSports Central – Independent and Minor League Sports News". OurSports Central. Retrieved July 5, 2012. ^ "B-Mets Break Up Perfecto, But Lose In The Ninth". OurSports Central. May 29, 2006. Retrieved July 5, 2012. ^ Mayo, Jonathan (September 5, 2006). "Eastern League playoff preview: Portland vs. Trenton/Altoona vs. Akron". MLB.com. Minor League Baseball. Retrieved September 14, 2012. ^ Matthews, Alan (October 5, 2006). "Eastern League Top 20 Prospects List: Hughes stands out in deep EL pitching crop". Baseball America. Retrieved July 10, 2012. ^ Matuszewski, Erik (May 20, 2007). "Yankees Face First Sweep Against Mets Since July 2004". Bloomberg. Retrieved July 6, 2012. ^ a b Hoch, Bryan (May 21, 2007). "Clippard neutralizes Mets in debut". MLB.com. Major League Baseball Advanced Media. Retrieved May 21, 2007. ^ Cotey, John C. (June 19, 2007). "Baseball Notebook: Orioles end 7-year odyssey". St. Petersburg Times. p. 6. Retrieved July 10, 2012. ^ Hoch, Bryan (July 24, 2007). "Chamberlain, Kennedy promoted: Yankees move top pitching prospects to Scranton/Wilkes-Barre". MLB.com. Milb.com. Retrieved July 6, 2012. ^ "Yankees trade RHP Tyler Clippard to Nationals for reliever Jonathan Albaladejo". ESPN.com. ESPN. December 5, 2007. Retrieved July 5, 2012. ^ Hoch, Bryan (December 4, 2007). "Clippard dealt to Nats for Albaladejo". MLB.com. Retrieved December 3, 2007. ^ "Remade Nationals mix of young, old". Reading Eagle. December 12, 2007. p. D5. Retrieved July 10, 2012. ^ Hume, Mike (February 20, 2008). "Picking Splinters: A Few Nats Notes | Falls Church News-Press Online". Falls Church News-Press. Retrieved July 5, 2012. ^ "Belliard activated from DL". MLB.com. June 9, 2008. Retrieved July 5, 2012. ^ "Clippard expected to pitch Saturday". MLB.com. June 12, 2008. Retrieved July 5, 2012. ^ "Clippard optioned to Triple-A Columbus". MLB.com. June 16, 2008. Retrieved July 5, 2012. ^ "Clippard likely to start". The Washington Times. June 26, 2008. Retrieved July 5, 2012. ^ "2008 International League Pitching Leaders". Baseball-Reference.com. Retrieved July 8, 2012. ^ "Nationals send Clippard, Maxwell to Triple A". USA Today. March 16, 2009. Retrieved July 5, 2012. ^ "Clippard adjusting well to bullpen move". MLB.com. May 4, 2012. Retrieved July 5, 2012. ^ Goessling, Ben (July 11, 2011). "The Goessling Game: With All-Star selection, Clippard's faith pays off". Masnsports.com. MASN. Retrieved July 6, 2012. ^ a b "Washington Nationals designate Kip Wells, call up Tyler Clippard for 'pen". Espn.com. June 24, 2009. Retrieved July 5, 2012. ^ Harlan, Chico (July 11, 2009). "Burnett And The Rest Of The Bullpen". The Washington Post; Nationals Journal. Retrieved October 21, 2013. ^ Zuckerman, Mark (October 6, 2009). "Nats want a lot from a little". The Washington Times. Retrieved July 10, 2012. ^ Kilgore, Adam (July 4, 2010). "Drew Storen, Tyler Clippard will be sharing roles". The Washington Post; Nationals Journal. Retrieved October 21, 2013. ^ Cockcroft, Tristan H. (June 16, 2010). "Tyler Clippard and Drew Storen are waiting in the wings should Matt Capps fail to hold his closer's gig – Fantasy Baseball – ESPN". Espn.com. Retrieved July 5, 2012. ^ Kilgore, Adam (June 22, 2010). "Nationals Journal – The return of Clip & Save". Washington Post. Retrieved July 5, 2012. ^ "2010 National League Pitching Leaders". Baseball-Reference.com. Retrieved July 5, 2012. ^ a b c d e Caple, Jim (July 12, 2011). "Clippard gets All-Star win without an out". Espn.com. Retrieved July 5, 2012. ^ Kilgore, Adam (September 23, 2010). "Tyler Clippard, and the Nationals bullpen, win again". The Washington Post; Nationals Journal. Retrieved October 21, 2013. ^ Kepner, Tyler (July 16, 2011). "From Yankees' Rotation to Nationals' Bullpen, and Thriving". The New York Times. Retrieved July 5, 2012. ^ "Zimmermann, Gorzelanny agree to deals with Nationals". Tsn.ca. Retrieved July 5, 2012. ^ "2011 National League Pitching Leaders". Baseball-Reference.com. Retrieved June 11, 2012. ^ "Zimmermann, Gorzelanny, Clippard agree with Nats". Newsok.com. January 17, 2012. Retrieved July 5, 2012. ^ Wagner, James (July 22, 2012). "Thrust into new roles because of injuries, Sean Burnett, Tyler Clippard are excelling". The Washington Post; Nationals Journal. Retrieved October 21, 2013. ^ Kilgore, Adam (May 22, 2012). "Nationals move Henry Rodriguez out of closer's role, and Tyler Clippard wants the job". The Washington Post; Nationals Journal. Retrieved October 21, 2013. ^ Wagner, James (June 24, 2012). "Tyler Clippard to remain Nationals closer even when Drew Storen returns from injury". The Washington Post; Nationals Journal. Retrieved October 21, 2013. ^ "Tyler Clippard of the Washington Nationals named the Major League Baseball Delivery Man of the Month for June". MLB.com (Press release). July 2, 2012. Retrieved July 4, 2012. ^ "Washington Nationals, Tyler Clippard reach deal, avoid arbitration – ESPN". ESPN.com. Retrieved February 12, 2015. ^ "Tyler Clippard returns to form in Nationals' bullpen". Washington Post. Retrieved February 12, 2015. ^ "Tyler Clippard named to National League All-Star team". The Washingtion Times. Retrieved February 12, 2015. ^ "A's, new reliever Tyler Clippard avoid arbitration". San Jose Mercury News. Associated Press. February 11, 2015. Retrieved February 12, 2015. ^ a b Ackert, Kristie (July 27, 2015). "Mets get closer Tyler Clippard, cash considerations from A's in exchange for minor league pitcher Casey Meisner". New York Daily News. Retrieved February 8, 2016. ^ Hickey, John (January 14, 2015). "A's send Yunel Escobar to Nationals for reliever Tyler Clippard". San Jose Mercury News. Retrieved January 15, 2015. ^ "A's acquire reliever Clippard, send infielder Escobar to Nats". Major League Baseball. Retrieved January 15, 2015. ^ "A's avoid arbitration with reliever Tyler Clippard – HardballTalk". nbcsports.com. Retrieved February 12, 2015. ^ Kawahara, Matt (May 16, 2015). "A's unable to capitalize on closer Tyler Clippard's success". The Sacramento Bee. Retrieved May 30, 2015. ^ "A's trade Clippard to Mets for Minors arm". MLB.com. July 27, 2015. Retrieved July 27, 2015. ^ Davidoff, Ken; Sherman, Joel (July 27, 2015). "Mets land A's closer Tyler Clippard as bridge to Familia". New York Post. Retrieved July 28, 2015. ^ Guardado, Maria (February 1, 2016). "MLB hot stove: Mets still interested in Tyler Clippard?". NJ.com. Retrieved February 8, 2016. ^ Piecoro, Nick (February 10, 2016). "Tyler Clippard happy to land with Arizona Diamondbacks". The Arizona Republic. Retrieved February 12, 2016. ^ Gilbert, Steve (February 8, 2016). "D-backs sign reliever Clippard to 2-year deal". MLB.com. Retrieved February 8, 2016. ^ a b "Yankees add Tyler Clippard to replenish bullpen". ESPN.com. July 31, 2016. Retrieved August 1, 2016. ^ Tasch, Justin (June 25, 2017). "Tyler Clippard still completely lost for Yankees, gets booed off the mound after giving up four more runs". New York Daily News. Retrieved April 1, 2018. ^ Miller, Randy (July 19, 2017). "Bummed Tyler Clippard knows he slumped his way out of Yankees plans". NJ.com. Retrieved August 14, 2017. ^ a b c Goldrick, Tim (August 13, 2017). "White Sox deal Tyler Clippard to Houston". CSN Chicago. Retrieved August 14, 2017. ^ Van Schouwen, Daryl (July 18, 2017). "White Sox trade Robertson, Frazier, Kahnle to Yankees, call up Moncada". chicago.suntimes.com. Retrieved July 18, 2017. ^ Zwelling, Arden (March 7, 2018). "Blue Jays sign right-handed reliever Tyler Clippard". Sportsnet. Retrieved March 7, 2018. ^ "Blue Jays' Tyler Clippard: Wins spot on Opening Day roster". CBSSports.com. Retrieved March 29, 2018. ^ Chisholm, Gregor (May 23, 2018). "Clippard first up for Blue Jays' 9th-inning work: Veteran logs 2 saves with closer Osuna away from team". MLB.com. Retrieved May 29, 2018. ^ "Blue Jays' Hernandez, Clippard appreciative of time with Astros". June 25, 2018. Retrieved June 25, 2018. ^ Davidi, Shi (August 3, 2018). "Hauschild helps Blue Jays get away with unsustainable approach". Sportsnet. Retrieved August 3, 2018. ^ "2018 Game Notes" (PDF). MLB.com. September 30, 2018. Retrieved September 30, 2018. ^ "Tyler Clippard joins the Indians on a minor league deal". letsgotribe.com. Retrieved February 20, 2019. ^ Kepner, Tyler (May 20, 2007). "Baseball — Farm-Fresh Products". The New York Times. Retrieved July 5, 2012. ^ a b Kepner, Tyler (May 21, 2007). "Magical Night for Rookie Pitcher". The New York Times. Retrieved July 5, 2012. ^ "PITCHf/x Player Card: Tyler Clippard". BrooksBaseball.net. Retrieved April 27, 2012. ^ Laurila, David (June 15, 2012). "Q&A: Nationals Closer Tyler Clippard". Fangraphs. Retrieved August 3, 2012. Wikimedia Commons has media related to Tyler Clippard.